The thin piece of plywood sat adjoined to the front door in its final stages of the new home’s building. We managed our introductions while balancing a slight bounce on the flexible sheet beneath us. In just weeks, new homes finished, we were to be neighbors. She was a news reporter for the Philadelphia ABC television network, he, in the computer business. More profoundly though, it was simply chemistry. A special warmth shared within a single moment, a handshake, as if meant to be, we shall be friends for many years to come. And we have. 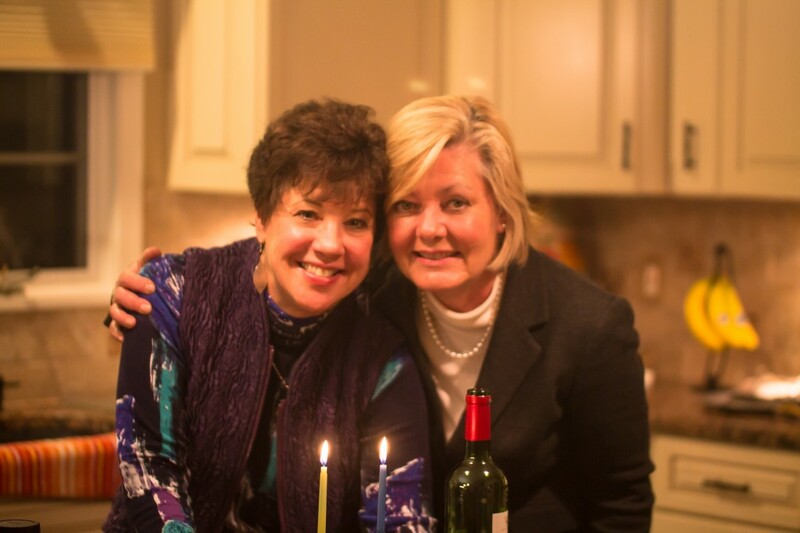 Jewish and Catholic neighbors who over the years have shared countless special traditions together, holidays, celebrations, embracing moments both religious and secular. Those years of raising our children, now adults, somehow too, now seem to have flown by in a blink. But our sharing continues. Now onto a new generation of sharing and teaching between us, another Jewish holiday with the next generation, my grandson, the first of our grandchildren between us. The biblical, historical, tradition among the Jewish people, the story of freedom is shared, the prayers are taught, and we light the candle acknowledging the first of this 8 days ahead, the festival of lights, Hanukkah 2014. 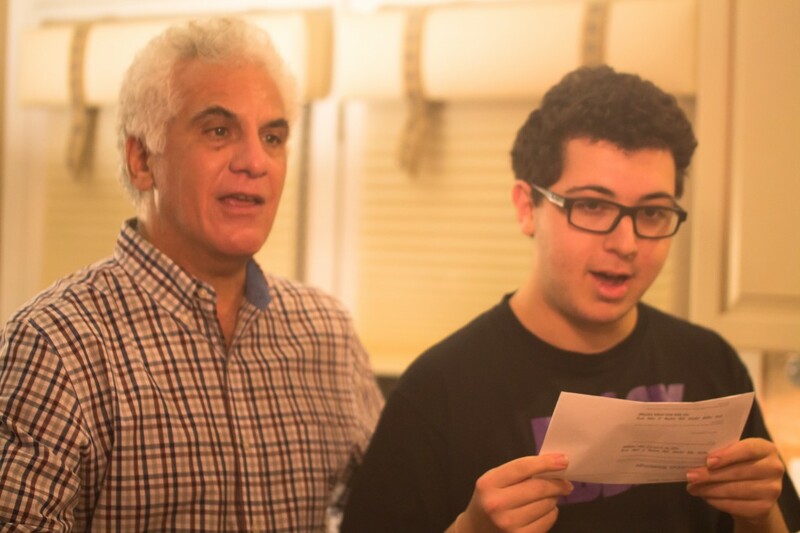 Karen and Dave’s youngest son, Alec, shares the story with my grandson, Jason. Dave oversees the prayer. The Menorah holds nine candles. The center candle is the Shamesh from which the candles are lit, adding an additional candle each day, building up to the eighth day when all of the candles will be lit. The basic history of Hanukkah surrounds the Jewish Maccabees reclaiming their Holy Temple, ridding off of idols, and identifying a small jug of pure oil formerly prepared by the High Priests that would serve to light the Menorah for one day, showing appreciation to God for saving them. The miracle, the light, giving honor to God endured for eight days instead. 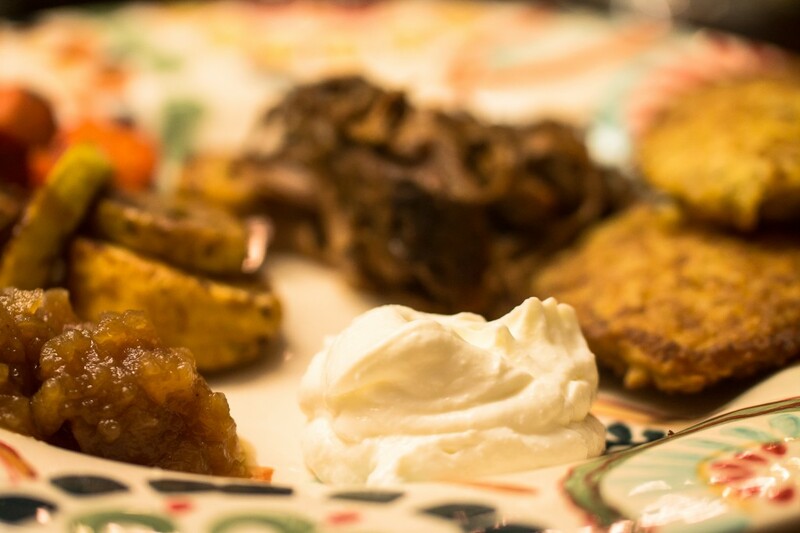 Besides traditional Potato Latkes served alongside homemade applesauce and sour cream for this year’s Hanukkah meal, we also enjoyed a smoky flavored beef brisket with gravy and roasted vegetables. 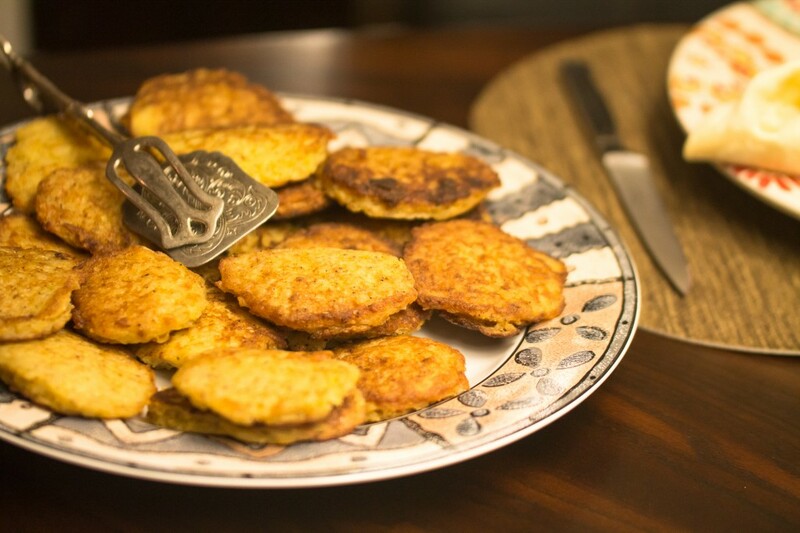 In case my youngest daughter, Alex, is reading this Post, yes Alex, Karen has frozen aside some latkes for you. 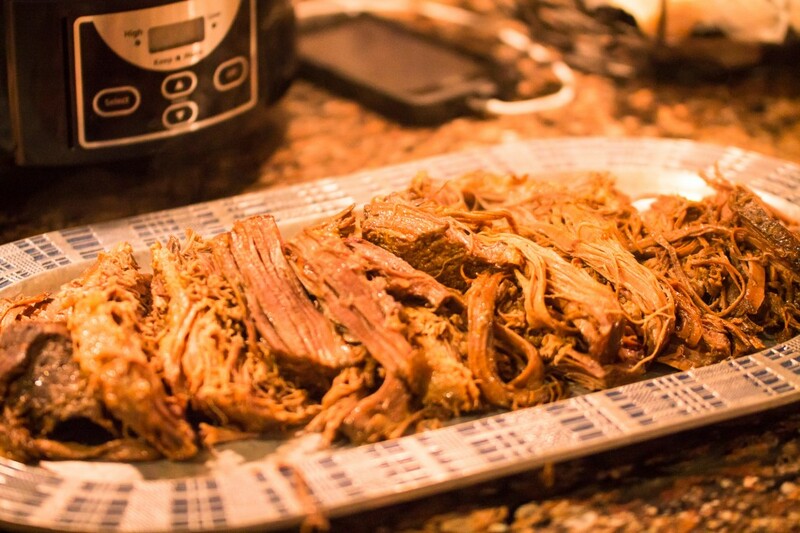 A quick tip on the delicious brisket cooked by slow cooker is a bit of liquid smoke, and a cup of prepared barbecue sauce added to the accumulated juices in the final hour of cooking. We did not, as when our children were younger, spin the dreidel, but, for this next generation between our families was provided the annual special treats of gelt, Hanukkah money, packed in little red netted bags of gold foil wrapped chocolate, resembling gold coins. Whether shared between our two families, or joining in with their extended families and many friends, each holiday at the home of our next-door neighbors always includes among my most very favorite of their traditions, the additional stories shared before commencing the meal. Now these stories are typically presented in more of a speech form, given Karen’s background in the communications industry, and Dave being very well studied in matters of the Torah and the Jewish faith. This year, presented by Karen, was a brief clipping from this weeks Philadelphia Inquirer. A story about what is likely the first public Menorah lit in the world happening forty years ago in 1954 on Independence Mall in Philadelphia, Pennsylvania. 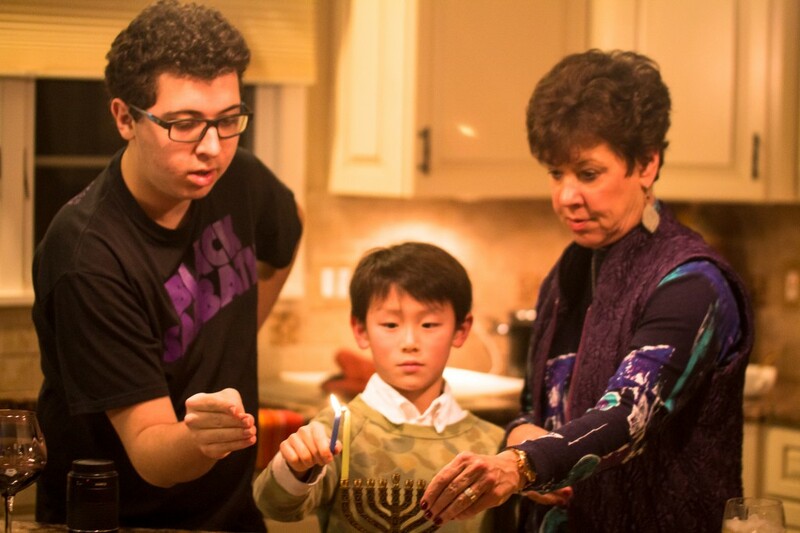 At the close of the Inquirer article, Karen shared a final message of interviewee, Rabbi Abraham Shemtov, one of the four Jews sharing a part in both the creation and lighting of the original Philadelphia Menorah lighting. Illuminating the freedom of the Maccabees, and that of Independence Hall, ” As long as there is freedom, we have a responsibility to share what we believe with the world-not to convert people, but to give everyone the opportunity to learn what’s in our Bible for them.” Rabbi Shemtov went on to say, “A public menorah is ” an opportunity to share” Judaism with the world.” “It’s not ours to keep.” And there it was. A touching and special sentiment my grandson cannot yet fully understand, but that we, neighbors and friends, have together shared, the depth of this blessing, people from two different religions and cultures, so many years of understanding and learning between us, simply begun in a moment of introduction balancing on a flexible piece of plywood leading to the front door in the final stages of the new home’s building. We were to be neighbors. We were to share yet with another generation of children together. Into this 3rd week of Advent in my own home, a time of preparation, Pope Francis spoke on this time being a call for “another inner attitude.” Joy. And so too this is among the themes we see throughout the Christmas season, Peace, Love, Joy. Peace too, that is living within us, and that which we may extend then to others. 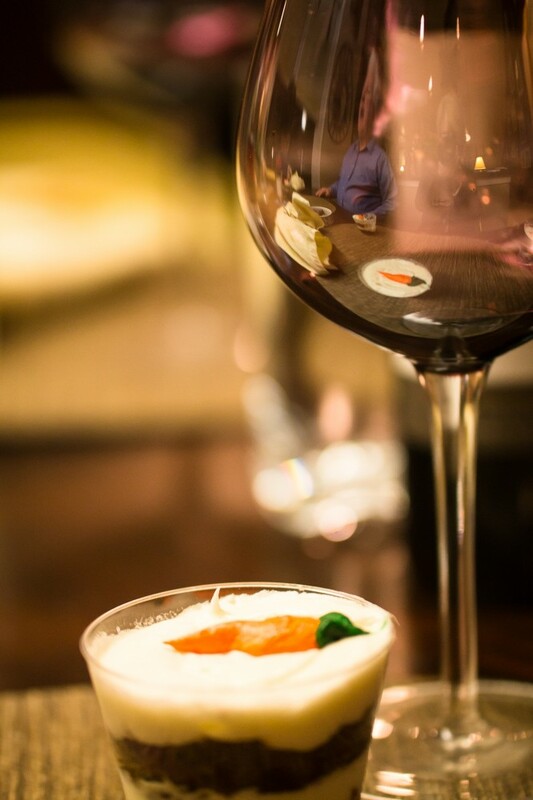 In this season of sharing meals, breaking bread, drinking wine, whatever your culture or religion, may you be so blessed as to be welcomed to the table of another, as to welcome others in the sharing of friendship and understanding. And you never know, like the blink of an eye, you may even continue the gift of sharing your blessing onto the next generation. 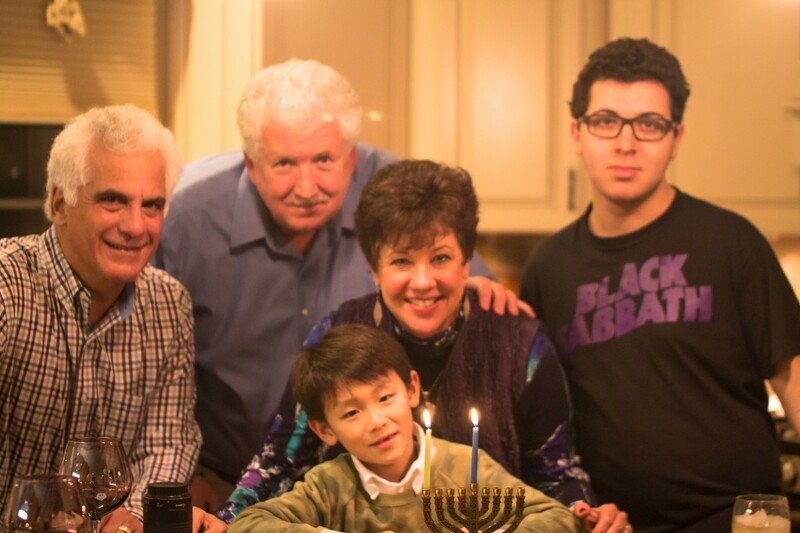 This entry was posted in Foods Around the World and tagged Happy Hanukkah 2014. Bookmark the permalink. Post a comment or leave a trackback: Trackback URL. Happy Hanukkah to all ! Hi Phil, Thanks and hope you enjoyed a very Merry Christmas!